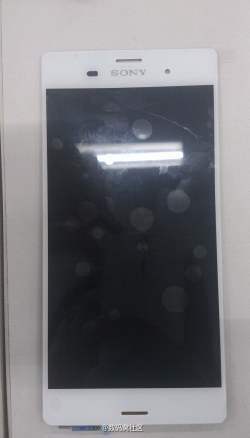 According to lots of rumors, Sony will equip Xperia Z3 with a 5.5-inch 4K resolution display technology with 6.1mm thickness and QHD resolution screen. It will resemble the old design of Xperia Z2 but it’ll be a little larger. Rumors are providing pretty appealing news that Xperia Z3 might boast a curved display technology since it’s not too far from now on. Sony always had issues with their loud speakers on Androids. Hope they’ll fix it from now on. Sony won’t leave any stone unturned to keep playing on their toes with the flagship smartphones. They’re going to put Octa-Core 2.5+GHz processor, bundled up with 4GB RAM. This much RAM might feel too much for a 5.5-inch screen but Xperia Z2 already boasted 3GB RAM. Sony might put two variants in test here. One will come with 32GB onboard storage and the other will accommodate 64GB. The micro-USB 3.0 cable and the Bluetooth 4.0 version is more than just enough to transfer data quickly and efficienty. Without some innovations, Sony flagships are not considered real. Every year, Sony brings something new to their flagship academy. Xperia Z3 might boast a full curved display. Plus, it’s going to provide heart rate monitoring system, pedometer, finger-print sensor etc. to give your device best security encryption possible. Xperia devices are camera-centric devices and in terms of Xperia Z3, this smartphone will feature large aperture and a strong flash as well. Xperia Z3 is going to pack 23.7MP shooter on its rear and 5MP on its front side. You’ll be able to record 4K resolution videos right from your rear camera. Also, the front camera can record in 1080p videos as well. Xperia Z3 will need to pack on a powerful battery to ensure the large device has got enough juice on itself. Sony might be putting 3,500mAh battery with fast charging features. Considering a huge consumer sector in various parts of the world wanting the upcoming Xperia Z3, Sony might include a price-tag of around $750 for the unlocked version. 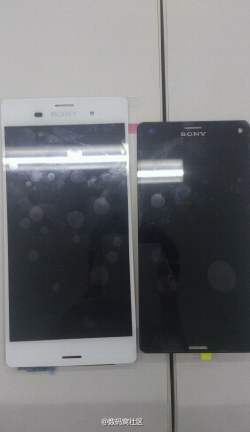 This leaked picture contains both Xperia Z3 (white) and Xperia Z3 compact (black), well basically Sony is also following other flagship smartphone makers like Samsung which is going to release Galaxy s5 mini and HTC which is going to release HTC M8 mini etc, so we can see Xperia Z3 compact in the market soon, so sales of Sony increases and gives a good competition to Samsung and other smartphone makers. Sony releases two new flagships every year to keep up with the rolling technology. Xperia Z2 already made its way into the market with recent specs. 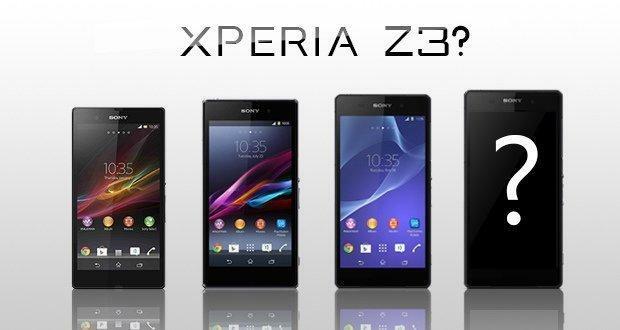 We’re thinking Xperia Z3 will try to compensate the flagship war among Nexus 6, iPhone 6, Galaxy Note 4 etc. and this is why they’ll try to come to the market within September or October of this year.